On 21 November, 192 delegates from the member countries of Interpol – the International Criminal Police Organisation (ICPO) – are going to meet in Dubai for the last day of the 87th annual session of Interpol’s General Assembly to elect a new president of the agency. 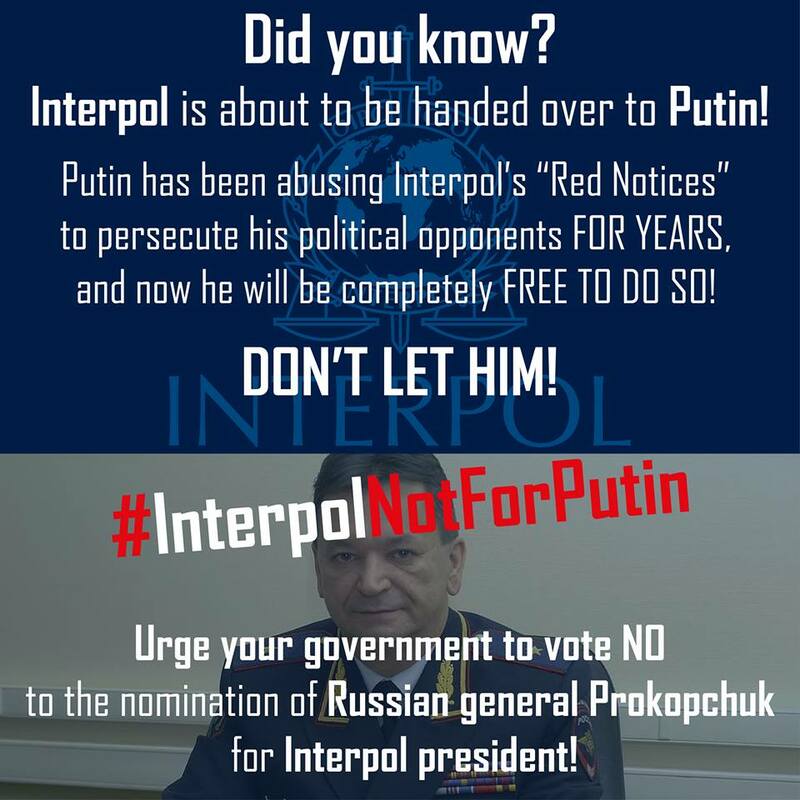 Media reports that a Russian police major general, Aleksandr Prokopchuk, will most likely be elected the president of Interpol have sparked outrage among activists and officials worldwide, as Russia has been abusing Interpol’s “Red Notices” to target enemies of the Kremlin regime. At the 87th session of the Interpol General Assembly in Dubai, consultations are underway regarding the candidates for the presidential post of the agency following the arrest of its former leader, Meng Hongwei, on corruption charges in China months ago. One of the shortlisted two candidates in the upcoming vote is current vice-president of Interpol Aleksandr Prokopchuk, the former Russian deputy interior minister, who will compete with Kim Jong Yang of South Korea, Interpol’s acting president. Prokopchuk became Deputy Head of the Russian Office of Interpol in 2006, then was appointed its Head in 2011, leaving the office only in 2016 to become the Vice-President of Interpol. This means, Forbes says, that every single abusive act that Russia has perpetrated through Interpol since 2011 was sanctioned directly by Prokopchuk. “Of course, we back the bid of the Russian candidate, and we undoubtedly want him to win the election,” Kremlin’s spokesperson Dmitry Peskov stressed yesterday, two days before the voting. A number of non-governmental organizations and human rights groups from different countries have called on the delegates of Interpol General Assembly session to prevent the election of Russia’s representative Aleksandr Prokopchuk to the presidential post of the organization. The Ukrainian Helsinki Human Rights Union has published a statement on their website signed by a number of human right groups and NGOs. The statement warns that “The strategy of the organization’s work will be formed and determined by the representative of the aggressor country” and reminds that the Russian authorities violate international law, have occupied the Ukrainian region of Crimea, and conducted open military actions on the territory of other Interpol member countries, Ukraine and Syria. The document also mentions the Russian meddling in the internal policies of other states using propaganda and intelligence services, crimes against the Chechen and Crimean Tatar peoples; Russian support for dictatorial authoritarian regimes and other violations. Another reminder in the document is that Russia and its allies – Kazakhstan, Tajikistan, Turkmenistan, Kyrgyzstan, Azerbaijan, as well as Venezuela and Iran – are leaders in misusing Interpol mechanisms for politically motivated, national, religious, social, and gender-related persecution. The NGOs call on General Assembly’s delegates to “take all necessary measures to prevent the use of this reputable organization, in violation of Art. 3 Constitution of INTERPOL, for prosecuting people within the framework of fabricated and politically motivated cases.” “It is important that the engagement of INTERPOL with Russia and other authoritarian regimes be ceased immediately,” the statement reads. The petition also reminds that three SS generals consecutively held the post of the President of Interpol – Reinhard Heydrich in 1940-1942, Arthur Nebe (1942-1943), and Ernst Kaltenbrunner (1943-1945). “We remember very well how the story ended,” the comment follows. The statement was signed in particular by Kharkiv human rights group, Ukrainian Helsinki Human Rights Union, Open Dialogue Foundation, Pylyp Orlyk Institute for Democracy, Journalist Academy Latvia, Institute for Peace and Democracy (Azerbaijan/Netherlands), IPTG (Austria) and many others. The list counts 54 signatures as this article is being written and the statement remains open to signing. Interpol’s Red Notice system is being abused, especially, though not exclusively, by Russia and there is a huge number of cases where men persecuted for their religious or political views are on the Interpol wanted list on supposed “terrorism” charges, says Halya Coynash of the Kharkiv Human Rights Protection Group. In many cases, the people are facing the same charges as the Ukrainian political prisoners in Russian-occupied Crimea, Ms. Coynash points out. Ukraine may consider the possibility of suspending membership in Interpol in case Russian representative Prokopchuk will be elected as the President of Interpol. “Russia’s probable presidency in Interpol is absurd and contradicts the spirit and goals of the organization. In case the arguments of Ukraine and a number of other countries fall on deaf ears, Ukraine will consider suspending its membership in ІСРО,” Ukrainian Minister of Interior Arsen Avakov wrote on Facebook. “If Prokopchuk becomes Interpol president it will allow the Russian regime to further expand the practice of using the ‘red notices’ to restrict freedom of movement and prosecution of undesirable persons in the interests of the odious regime,” Avakov said. Six German parliamentarians with foreign policy focus demand Germany to not vote for Russia’s candidate Prokopchuk. The Lithuanian parliament, Seimas, has adopted the resolution calling on the Lithuanian representative in the General Assembly of Interpol to “support the alternative candidate,” and stating that “Lithuania, together with other democracies, should immediately consider withdrawing from this organization” if Prokopchuk will be elected the Head of Interpol. Update 2018/11/21 01:39: Britain also threatens to walk away from Interpol if ‘ex‑KGB agent’ Prokopchuk elected, reports The Times. Russia is ready to misuse Interpol against Bill Browder. Again. Yesterday on 19 November, just on the next day after the media reports that a Russian candidate could take control at Interpol, Russian prosecutors announced new charges against American-born British financier William Browder. They accused him of organizing a “transnational criminal group” and of murdering his former Russian attorney Sergei Magnitsky. Magnitsky was a Russian tax accountant who specialized in anti-corruption activities, he alleged there had been large-scale theft from the Russian state carried out by Russian officials. Mr. Magnitsky died in a Russian prison in 2009 after his 11-month imprisonment. The Russian officials attributed his death to a heart attack, but the leader of the Moscow Helsinki Group, Ludmila Alekseeva, reported that Magnitsky had died from being beaten and tortured by the Russian Interior Ministry’s officers. Browder had accused Russian officials of being behind the death of Magnitsky and his efforts led to the US government adopting the Magnitsky Act, which punishes Russian human rights violators. Earlier Russian courts have twice sentenced Bill Browder in absentia to nine years in prison for fraud, tax evasion, and deliberate bankruptcy. On his visit to Spain in May 2018, local police arrested Browder on a Russian Interpol warrant, however, he was released two hours later. “Russia has made seven abusive attempts to have me arrested since 2013 on politically motivated charges. If Russia is allowed to take over Interpol, it is like the mafia taking over global law enforcement,” Bill Browder told Newsweek. Interpol has elected South Korean Kim Jong-yang as its president, despite it was widely expected that Russian frontrunner Alexander Prokopchuk would take the post.